This very powerful intensive treatment product moderates seborrhoea, restores the quality of sebum, reduces skin thickness and unclogs pores. In just 7 days, the skin is purified and sebum secretion is normalised. Did you over-indulge this long weekend? Thalgo Activ-Drainer – a new version of our hugely popular Slim 7 Refining Drink jump starts the weight loss process! An exclusive food supplement that helps to eliminate water and fat to refine the figure! Thalgo High Performance Firming Cream is the winner of Dermascope’s Aesthetician’s Choice Award 2016 Body Firming Cream category. Thalgo High Performance Firming Cream helps firm the deeper layers of the skin. The Sculpt Active technology helps combat the appearance of skin slackening. The figure looks redefined, visibly re-sculpted and reshaped. Feeling dehydrated, sluggish and depleted? Thalgo L’Oceane is a natural sea water supplement to provide your body everything it needs to be balanced and nourished! Struggling with puffy eyes, dark circles and fine lines around the eyes? The Thalgo Collagen Eye Roll-On has been uniquely designed to combat puffiness and dark circles with the state-of-the-art metal ball application for an ice cube effect. New from Thalgo! Cold Cream Marine Line! For very dry and sensitive skin, lab created line Thalgo cold cream marine. The New Formula is based on the unique oil from, which has the ability to replenish lipids in the skin. It is capable of effectively regenerating and soothing even the most dry and sensitive skin. Cold Cream Marine line nourishes delicate, dry and sensitive skin and increases its tolerance threshold. Products for Face and Body Available! 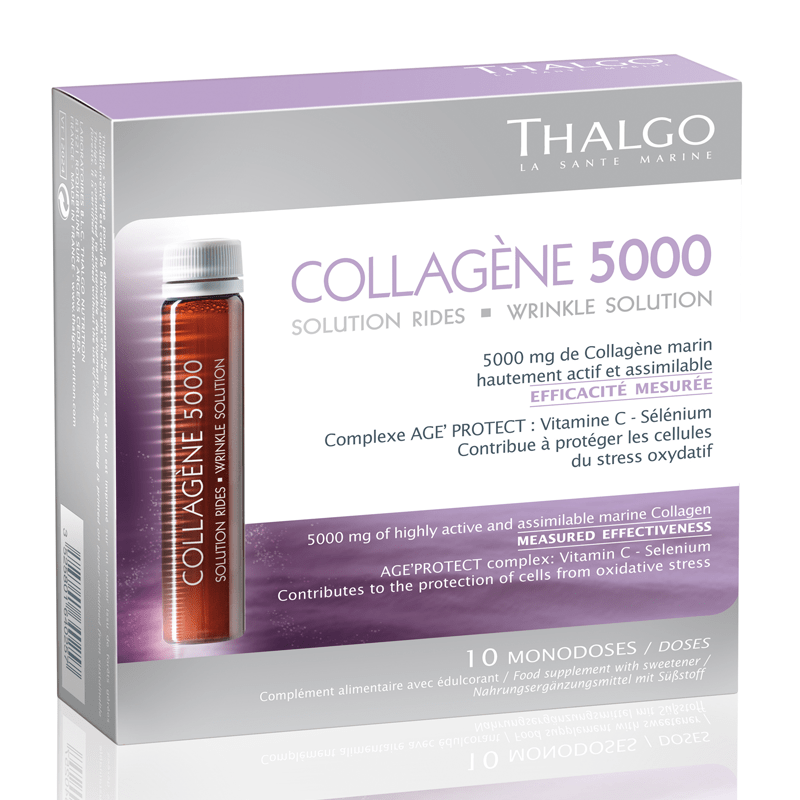 Thalgo Collagen 5000 is the easiest way to have collagen work to treat our skin from the inside out! Try it today!